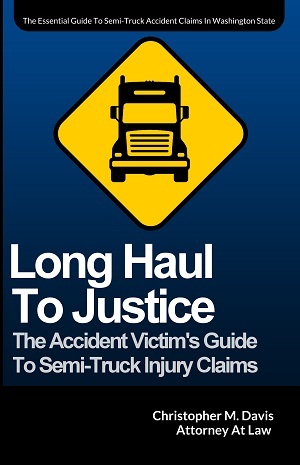 Who Can Be Held Legally Responsible For Injuries From Semi Truck Accidents? In the event that someone is injured in a motor vehicle collision involving a large semi truck, a qualified personal injury attorney can often pursue compensation from the semi truck driver, trucking company, cargo companies or truck part manufacturers. Truck drivers have identical responsibilities as other vehicle operators and when they violate those responsibilities, they can be held liable for the injuries and other damages that someone may suffer as a result of their negligence. While the majority of commercial truck drivers are safe professionals, too many tragic accidents occur on a daily basis between large commercial trucks and other passenger vehicles. These accidents are generally much more complicated because of the extent of the injuries that typically result, as well as the various parties that may potentially be held liable. In the United States, it is estimated that there are more than 100,000 semi-truck accidents - those involving tractor-trailers and other large trucks - on average each and every year. Tens of thousands of these crashes result in some form of injury to the persons involved, occasionally resulting in death. The difference in the size and weight of the vehicles involved in an accident play a huge role in the severity of collision. For example, a commercial truck may weigh more than 80,000 pounds when an average size vehicle only weighs 3,000 pounds; the difference is immense. Semi truck collisions occur for multiple reasons including unfamiliar roadway, making illegal maneuvers, inattentive driving, driver fatigue and driver illness. Other contributing factors can be truck malfunctions, including brake failure, due to improper maintenance or cargo shifting including overloaded or poorly loaded trucks. Environmental problems such as traffic flow interruptions, roadway problems, weather problems or sightline obstructions also contribute to accidents. Remembering that truck drivers may be going on very little sleep is a helpful reminder to keep your distance and to not make sudden moves, be extra cautious. 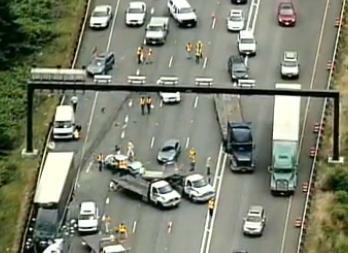 In these accidents the occupants of the smaller vehicles are the ones who stand to lose the most. While occupants of the semi truck often times walk away from the serious collisions with minor cuts and bruises, drivers of passenger vehicles stand very little chance against the sheer size of these trucks and are far more vulnerable to serious injuries. Knowing how and why truck collisions happen and developing an awareness about the risks of being injured in a crash can help both truck drivers and passenger vehicle drivers avoid serious accidents. A driver operating a large truck is trained to be attentive and safe on the road but accidents do happen and can often be very serious matters. There are many reasons why a large truck accident may occur. One reason has to do with difficulties drivers may have in controlling the overall size of a semi truck or shipping-purposed vehicles. Generally speaking, large trucks have more blind spots than the average car does and as a result, the ability to see other drivers on the road can be more difficult. Truck drivers need to be extra careful when turning and merging to avoid injuring other motorists. One common type of truck accident often results from jackknifing, which is when a truck loses control and sides across multiple lanes. Another possible cause of large truck accidents involves poorly secured loads which can and will fall into the roadway, creating dangerous obstacles for fellow motorists. Another reason trucking accidents occur is the result of driver fatigue and the practices of trucking companies. Some trucking companies push their drivers to the limit and force them to drive long hours without a break. The result of having a tired and fatigued driver is mistakes are made while driving which put other motorists at risk. When a driver is fatigued their decision making skills are slower as well as their reaction time. In order to combat fatigued driving, responsible trucking companies enforce Hours of Service (HOS) regulations designed to limit the number of consecutive hours a truck driver may spend behind the wheel before taking time to rest. Unfortunately, many companies do not strictly follow HOS regulations and put the safety of their drivers – as well as countless other innocent motorists – in serious jeopardy. On top of these factors, fatigued drivers also run the risk of simply falling asleep while behind the wheel. This is an inexcusable situation, and in the event that someone is injured because of a fatigued driver, the driver and trucking company need to be held responsible for their negligence. Also, allowing trucks adequate space to stop is vital to ensure the safety of you and any passengers in your vehicle. Because of their increased momentum, semi trucks have extreme difficulty stopping in a short amount of time and require much more space to decelerate and come to a stop than a normal passenger car. If you’re driving in front of a truck, it’s best to stay ten to twenty car lengths ahead of it to allow it time to stop without hitting you. Similarly, if you’re passing a truck, you significantly increase your chances of being injured in a crash if you cut back into the lane right immediately in front of it. Wait until you can fully see the semi truck’s headlights before moving into the lane. If a truck needs to pass you or merge into your lane, allow it to do so, even if you think you have the right of way. A momentary inconvenience is much better than a collision, and truck drivers often become reactive to motorists in front of them who takes such quick action because they have difficulty maneuvering the way cars do. Safety is of high importance when sharing the road with a semi trucks due to the lengthy amount of hours they drive on our highways and freeways. That is why new regulations were recently passed to ensure the safety of semi truck drivers and drivers of the road. Preventing fatigue for this type of industry is vital and will lower the rate of collisions. On average, one out of four semi truck drivers’ falls asleep at the wheel once in a period of one month. Three new laws were passed to decrease the level of fatigue in truck drivers and ensure the safety of travelers on highways and roads. First, the new regulation restricts the amount of hours a truck driver can drive in one day at eleven hours. Second, truck drivers used to be allowed to drive up to eighty-two hours in a week; now those hours have decreased to seventy hours. Finally, a driver must have a thirty-four hour off period in between work weeks to allow time to recover and be ready for their next work week. Truckers may not be happy that these new laws were passed but these new regulations will ensure the safety of motorists on the road. Along with semi truck drivers, all other motorists can be sure to practice road safety as well. Make sure to get plenty of rest before driving, eat well and stay fit. Driver fatigue and lack of attention can significantly increase your risk of a crash. Watch out of highway construction, stay alert and be award of your surroundings. Avoid blind spots around semi trucks, and if you can’t see the truck driver’s mirrors then it is likely that the driver cannot see you either. If you or a loved one has been significantly injured in an accident with a semi truck, there’s a good chance you would benefit from consulting with a personal injury attorney about the accident. Call our office today at (206) 727-4000 or contact us online to have your case reviewed by our award-winning legal team. Thanks for sharing these informations for me. The truck repairing is a difficult process. Keep sharing more about the same.